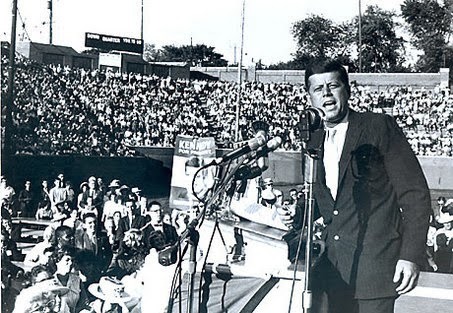 JFK at Atwood Stadium in Flint, Michigan. "I started kindergarten at Civic Park in 1959. Lived on Walter Street near Bassett Park. On November 22, 1963 I was on my way to class when another student came running down the hall yelling in a deep southern accent, "Yippee, they killed Kennedy." We filed into Mr. Jorgenson's science class, which was in the basement level. He was very solemn. After we were seated and quiet he said, "I can't tell you what has happened today but I can tell you that you will remember this day for the rest of your lives." Then we were all excused and sent home. My parents were already home watching the television. They both had tears in their eyes even though they had supported Nixon in the election. My father was a decorated combat Marine from WWII. I had never seen him shed a tear. This had a huge effect on me." I was 7 yrs old when he was assassinated and I remember watching it all evolve on TV. I lived in Burton, MI and went to Holy Redeemer school. It was so horribly shocking to me. Today I live in Dallas. I work downtown Dallas and walked over toward Dealey Plaza through the cold misting rain to see what I could. They had a nice ceremony in spite of the rain. Or was it just the tears that were falling down from heaven? 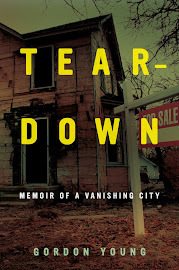 Oddly enough, there are TWO Flint Expatriates of sorts who are prominent in Kennedy assassination research. One is David W. Mantik, Ph.D., MD, who was an Assistant Professor of Physics at the University of Michigan-Flint from about 1968 to 1972, when he left to go to Medical School. He now practices Radiation Oncology in California. He believes that both the X-Rays of Kennedy's skull and the Zapruder film were tampered with, and has come as close as anyone to scientifically disproving the single bullet theory. The other is Dale Kenneth Myers, who worked as a Disk Jockey at WFDF and WTRX back around 1980. Dale later authored a book, "With Malice", about the events surrounding the shooting of Officer J. D. Tippit later that fateful day in Dallas. Dale became an expert in computer animation, and launched a successful career in advertising production with computer animation. In 2003, Dale produced a video animation of the events in Dealey Plaza that supports the single bullet theory and Warren Commission conclusions The animation was shown on TV specials that year on the 40th Anniversary of that sad day in Dallas. In 2004, he was awarded an Emmy for his animation. They are some of the most respected researchers in the field and they are both big on the symposium circuit, despite holding diametrically opposing views of the conclusions of the Warren Commission. Two Flint Expatriates, different times, different backgrounds, different views. I'm not sure who you are, but I was in the same class with you because I remember also being brought down to the basement to Mr. Jorgensen's class. Then we were sent home. Strange how we still vividly remember that certain day in November over 50 years ago. I will always remember with fondness by years at Civic Park. All the teachers - Mrs. Allen, Mr. Gundry, Mr. Grindstaff, Mrs. Donaldson, Mrs. Champion. What great memories.